Blackberry Cake With Caramel Frosting is a very old-fashioned recipe. How I came by it was we were recently given a recipe box of old recipes once used by my husband’s mother. 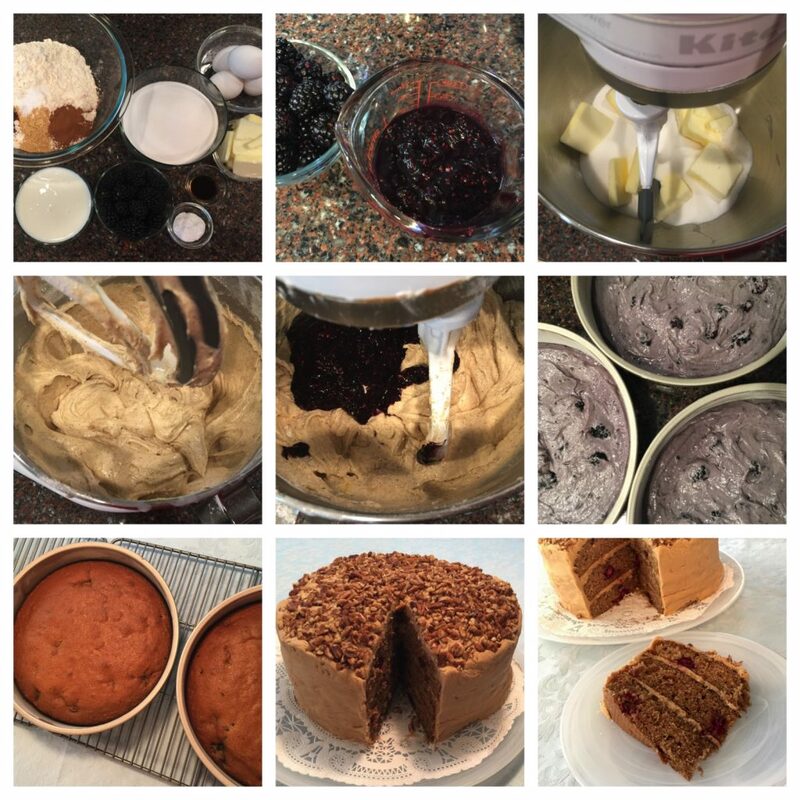 In that recipe box was a very old-fashion recipe for Blackberry Cake. With some investigation, I discovered that it was frosted with a creamy, rich caramel frosting. As it is with many of these historic recipes, it took a few tries and tweaks to make it turn out as my husband remembered it as a child. 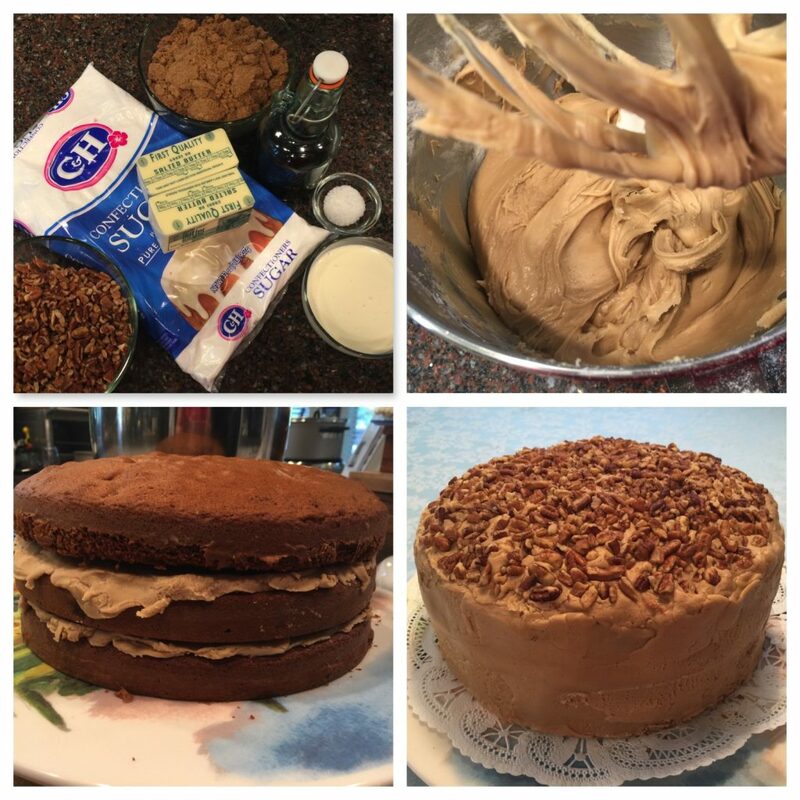 Ingredients: Makes 1 layer cake or 8 to 10 servings. Preheat the oven to 350°F. Line 3 9” cake pans with parchment and then grease and flour each pan and set aside. Puree 1 cup of the fresh Blackberries and reserve for later use. In a small bowl, combine the baking soda and buttermilk until dissolved and set aside. In a large separate bowl, combine and sift the flour, salt, and spices. Using a stand mixer, cream the sugar and butter until light and fluffy. Add the eggs, one at a time, until combined and then add the vanilla. Alternately add the sifted flour mixture ⅓ at a time and the milk mixture ½ at a time; starting with the flour mixture and ending with the flour mixture. Add the blackberry puree (if using, add the chopped nuts) until combined. Distribute equal amounts of the batter into the prepared cake pans. Evenly distribute the remaining whole blackberries over the batter in each pan. Press the berries into the batter and gently smooth the batter over the berries a bit. Bake for 25 to 30 minutes or until a cake tester or toothpick comes out clean. Allow the cake to cool in the pan for up to 15 to 20 minutes. Carefully invert the cakes onto a cooling rack and allow them to cool completely. Notes: Fresh blackberries are preferable. However, if they aren’t available frozen will do. The cake batter is quite thick, not to worry; it will turn out fine. Be careful not to over-bake the cake; start testing for doneness at 25 minutes. While the cakes are cooling, prepare the caramel frosting. This caramel frosting is of my own making. The original caramel recipe used was nowhere to be found. 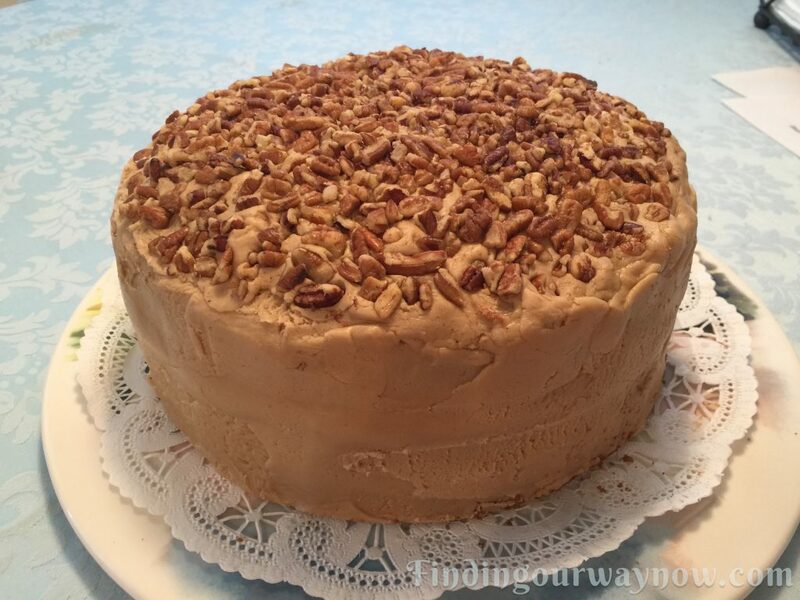 It is a creamy, rich caramel frosting that can be used on many other cakes, cupcake, cookies, donuts or whatever you desire. Melt the butter in a saucepan over medium heat. Add the brown sugar and cream, stirring until the sugar is melted. Bring the mixture to a boil. Boil for 1 minute. Transfer the hot sugar mixture to a stand mixer. While the mixer is running on low, add the confectioners’ sugar a little at a time. When all the sugar is added, and the mixture is smooth, add the salt and vanilla. Beat on high until the frosting reaches a smooth, spreadable consistency. Notes: It’s easy to add too much confectioner’s sugar. Even though the frosting appears to liquidity, it will stiffen when it cools. Start checking the consistency at 5 ½ cups and add a bit at a time. If the frosting is too thick, add a tablespoon of heavy cream or so at a time. Be sure to add cream in small amounts to reach a spreadable consistency. As with the sugar, be careful, you can always add cream, but you can’t take it away if you add too much. Spread a layer of icing between each cake. Using a kitchen scraper evenly spread the frosting on the top and sides of the cake. If desired, finish it with a generous garnish of chopped pecans on the top; pressing the nuts lightly into the frosting. Reserve any leftover frosting for another use. Allow the cake to rest for a bit before serving. The cake will last for up to a week in a sealed cake carrier. This Blackberry Cake with Caramel Frosting is a very special cake for many reasons. 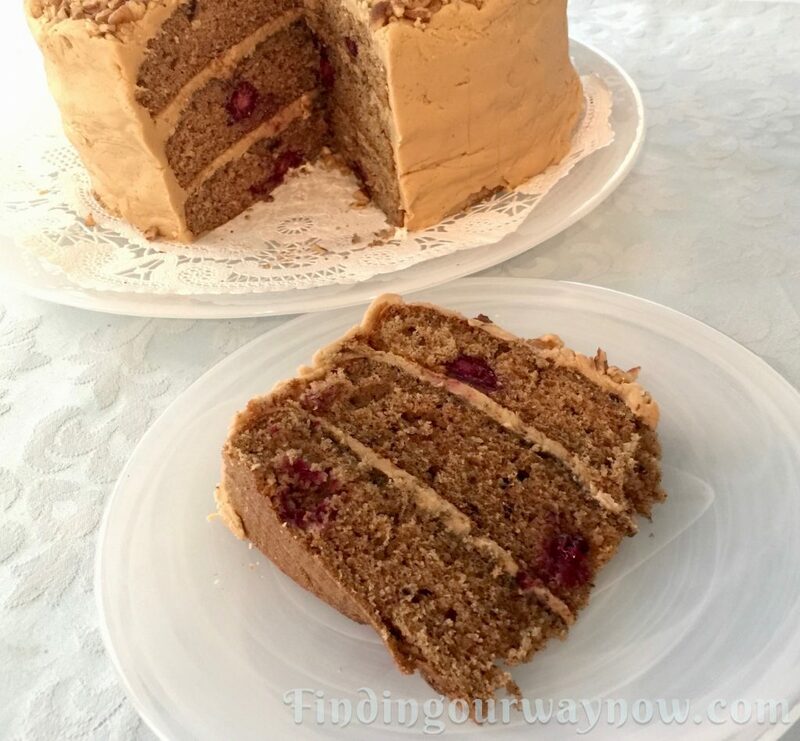 It tastes divine, it’s a recipe that brings back many memories for my husband, and it’s a beautiful cake that can be shared with everyone. Enjoy.